Sundays are hands down my favourite of days. I grew up in Switzerland where on Sunday's everything is closed for 'ruhetag' (day of rest) so there's never been anything to do, so I've always been a kind of couch potato kind of person on Sundays. 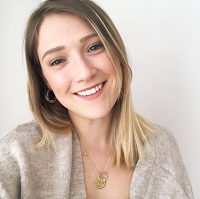 I've popped together a list of my Sunday essentials which I think make a Sunday the ultimate day of peace and quiet. 1. I love to bake on a Sunday. 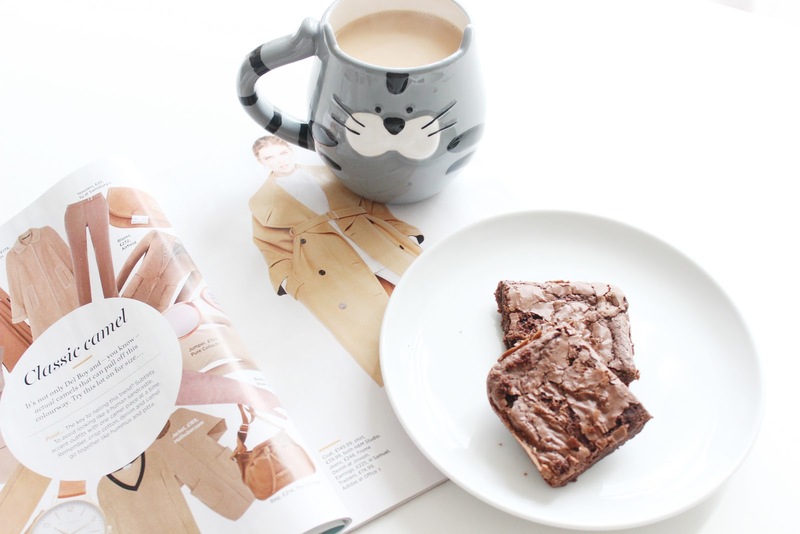 I've always found baking extremely therapeutic and to me there's nothing better than fresh brownies, cakes or treats to have with a cup of tea at 4 o'clock (yes I am such an English cliché and yes that is a cat mug from Matalan). 2. I don't always pick up a magazine but I think it's such a lovely thing to treat yourself to reading either in the bath, or when having that brownie and cup of tea! 3. I find that Sunday's are incomplete without a movie. James Bond and Harry Potter are my go to Sunday movies because a) I'm a massive HP fan and b) I always grew up watching James Bond with my dad on Sundays. I actually don't find it a relaxing Sunday unless I'm completely slobbed out in front of the sofa with zero cares in the world haha! 4. Hello more clichés. A bath! Nothing preps me for a Monday morning more, than sitting in a warm bath either reading a book, magazine or some sort of crummy TV show! I obviously always go for a Lush bath bomb (although saying that, last weekend I had an allergic reaction to one of them, whoops! Some of my all time favourites are: Butter Bear, Butterball, Rose Jam, Sparkly Pumpkin and A French Kiss. 5. Face Masks are a great way to restore your skin after a week of wearing makeup and the Lush Fresh Face Mask Oatfix is great for those with dry skin! 6. It's important to also get your room into an aesthetic cosy feel. 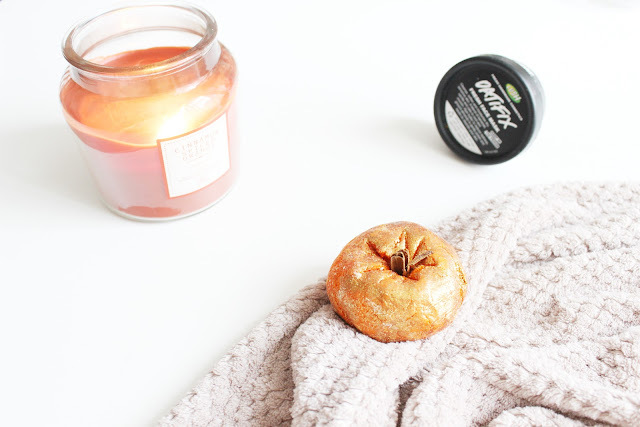 I pretty much live in my sweats and my dressing gown (from Primark and the comfiest thing ever) all Sunday along with light a bajillion different candles (all Autumnal themed as well) - This one is a Cinnamon Spiced Orange one from Matalan which just brings out so many cosy feels! Let me know in the comments below what your favourite day of the week is and what you do to turn into a couch potato for the day! These are all my Sunday essentials too! I really like to get some relaxing time in. Sundays are meant to be lazy days. If given a chance I would change the name Sunday to lazy day hahaha. Lazy, movie, masks are my kind of Sundays too. i love sundays! this post has made me really want to walk to lush and grab a few bath bombs. i grew up watching james bond with my dad on sundays too haha! Lovely post - sunday movies are the best! I'm definitely growing to love Sundays - such a lovely list of bits to do. I haven't done baking on a Sunday for quite some time, definitely need to get on that one! Your brownies look delicious. baking, bathing and blogging is my favourite sunday trio and a must to start a new week. I really love the ambience of this post, all bright and pampering, what I expect my Sunday morning to be. You remind me that I need to pick up baking brownies again, I used to love making them so much since they're so easy to whip up. 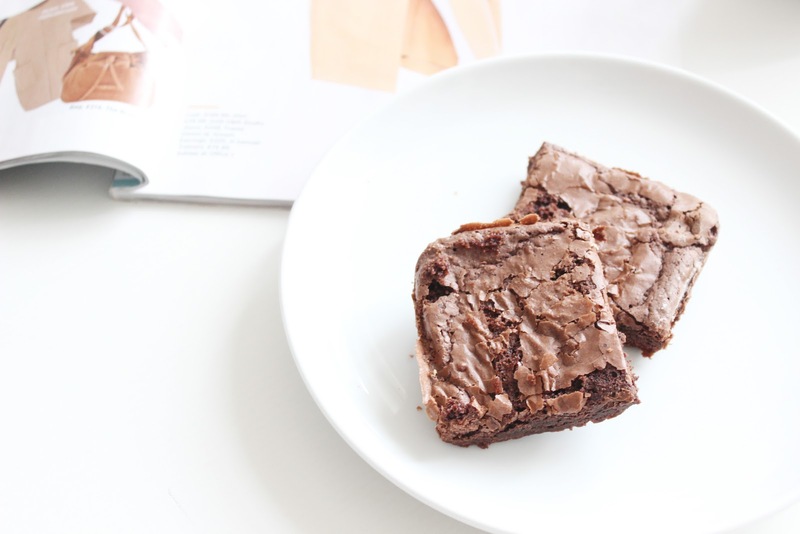 That brownie looks amazing, making me so hungry! I wish my Sundays were this lovely! You pretty much outlined the perfect Sunday to me, but I've been so busy lately.